Plastic game hub with spaces for cards and a central area to roll dice. 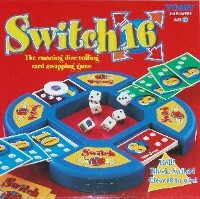 Gameplay: Each player has a set of cards piled in order from 1 to 16 with 1 at the top. Players take it in turns to roll the number of dice displayed on their top-most card. If one of the dice shows the number on the card, or any combination of the dice can be added together to give the number, the card is discarded. It's possible to discard more than one card with each roll. If a player manages to discard a card in their turn they can have another turn. If they don't manage to discard any cards on an extra shot, however, they regain cards. 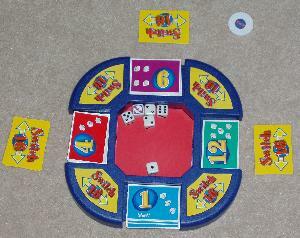 As an added complication, players have to roll the Switch dice whenever they roll the numbered dice. This can allow them to switch cards with another player of their choice, force them to switch with the losing player, do nothing or give them control of the Block chip. 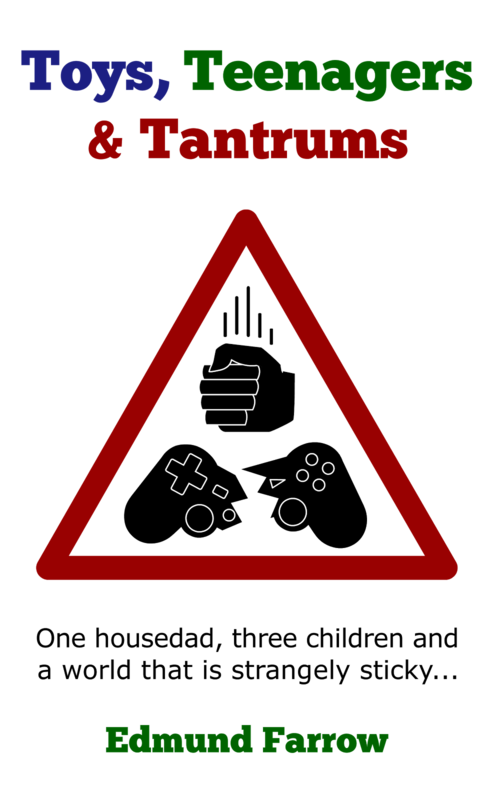 If held, the block chip protects a player from getting switched. If placed on another player's deck, it prevents them from discarding cards until it's moved. Object: To be the first player to discard all their cards. Age: 7+ officially. The main activity involves rolling dice, so young children can take part as long as someone playing is able to do basic mental arithmetic quickly. One player will need to be at least eight, though - working out whether it's possible to make 13 or 14 from some combination of 1, 3, 3, 4, 5 requires a surprising amount of thought. Comments: The instruction sheet makes Switch 16 seem complicated but it's actually pretty simple once you've seen it in action. Essentially, it's a game of dice, counting and sudden reversals of fortune. It moves fairly fast and players are involved even when it's not their go, since everyone can see the dice and join in with trying to find suitable combinations of numbers. Of course, older children (10+) might not want to help each other out but Switch 16 won't distract them for long anyway - they'll quickly slope off to their room to play online Poker and to hunt out strangers in chatrooms to befriend and then blackmail. It's debatable whether all the switching adds much to the game. It's a faff swapping the cards around and requires some co-operation between the players involved to do efficiently. My kids tend to stare at the piles and expect them to magically move by themselves. Then they all reach for the same pile, bicker a little and forget whose go it is. If this happens for several turns in a row, it can become exasperating. The player who takes the most risks usually ends up winning anyway. Conclusion: Once you get to grips with it, it's an entertaining game with a touch of maths. Has a little strategy but anyone can win. The dice tray is sensibly lined with rubber to stop everyone getting a headache. Swapping the piles over can be tedious. A game can take a while to get going if no one rolls a 1.